Today you guys is a very special day, I have my first - very first OPI nail polish review!! I bought this a few weeks ago and just recently received it in the post. HOLY COW. It is the prettiest bottle and glitter nail polish I have ever seen. When I opened the package I had one of them HALLELUJAH moments..with my jaw dropped and my eyes popping out. 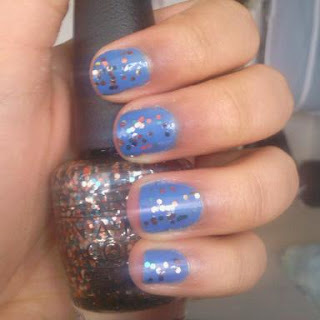 This polish is in the shade 'The Living Daylights' it is part of the Skyfall James Bond Collection that OPI released. The colour is actually a mixture of large glitter particles in the colours - bronze, silver, gold and then a lovely 'sky' blue. The polish looks great built up with a few layers to really get that glitter effect or just a simple one coat as you do with normal glitter polishes. 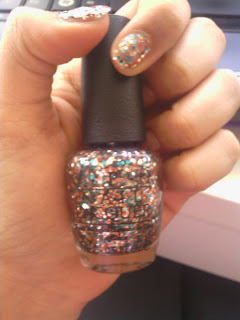 My only pet hate about this polish is that the glitter gathers on the nail, so when you apply it to your nail bed it all falls together instead of spreading out evenly. However, that makes me love it more as it gives a really nice effective!